The Mask and the Pose, a photo by timtak on Flickr. As Watsuji argues the Japanese self "persona" (originally meaning "mask" in Greek) centres upon the face or mask. 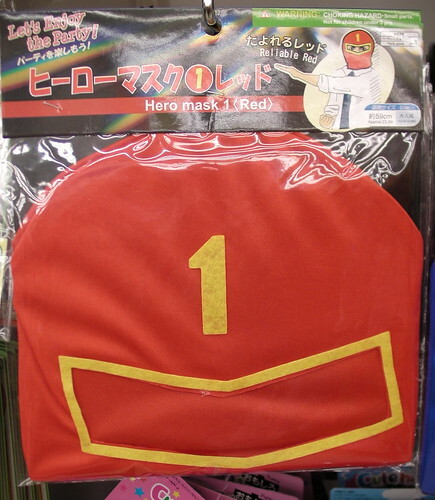 To each of these costume masks there is attached in the top corner a a pose, similar to those poses performed by power rangers and masked rangers when they transform (henshin) into their super form. As I have argued before, you, or the Japanese, don't get to have a mask, or even a face, unless you can strike poses. Westerners can't perform poses (Kata) and as Duval and Wicklund pointed out, they can not see their faces unless they are in front of mirrors. They do not identify with that which can be seen, nor point at their noses to indicate themselves. Western psychologists and philosophers claim that is only through language that one can see oneself from the point of view of a generalised other, as opposed to the other which one faces, and that a generalised other is a precondition of having an individual self (Professor Cohen rather misunderstands Mead on this point I fear:-). However, at the same time, Judith Bulter, using Derrida points out that repetitive "iterate-able" actions turn the body into a sign. One need not go as far as post modernism however. The father of social psychology George Herbert Mead argues that signs, including gestures, are understood from the point of view of others. This is not to suggest that Japanese are always signing with their bodies, but the act of signing with their bodies acts as a catalyst or transitional "stage" in the assumption of an "imaginary" identity. The mirror stage, and the Western super heroes suit, allows him to transform into his super identity - his ego, his words, his signs. Conversely, the poses or signs that Japanese superheroes perform allow them to transform into their suits, into their masks. Hence, all this posing (and Kata) that Japanese perform allows them to *see themselves* have an autoscopic gaze and in so doing have, and identify with their face.